The Commission also briefed General Assembly members on the overall performance of the Illinois economy, relative to other states, during the 10 years that have taken place since the start in 2007-08 of the “Great Recession.” Illinois’ economy has underperformed its Midwestern neighbors and has not grown as fast as the U.S economy as a whole. Declines have been concentrated in: (a) construction, and (b) the manufacturing of durable goods such as machinery and fabricated metal products. Within the overall decline in manufacturing have been bright spots in the manufacturing of nondurable goods such as chemicals and refined oil products. State rolls back LLC fees, slashing filing costs for small businesses. Gov. Bruce Rauner has signed legislation that substantially reduces startup, annual filing and other fees for limited liability companies (LLCs), the organizational structure preferred by many of Illinois' 1.2 million small businesses. The new law will encourage more businesses to form in Illinois rather than go to other states to escape high fees. Effective immediately, the filing fee for new LLCs drops to $150 from $500 and annual report fees drop to $75 from $250. Previously, Illinois charged fees that were among the highest in the nation. "This is a step in the right direction for our small businesses," Rauner said. "The new rates are more competitive with other states. By easing the fee burden for LLCs here, we are sending a message to entrepreneurs and small business owners in Illinois: Start here and stay here." "This is a clear win for business in Illinois," Rauner said as he penned the legislation into law to rounds of applause. Department of Commerce and Economic Opportunity Director Sean McCarthy said reducing LLC fees sends a positive signal. "We support businesses that are looking to grow, invest and create new jobs in our state, regardless of their size," McCarthy said. 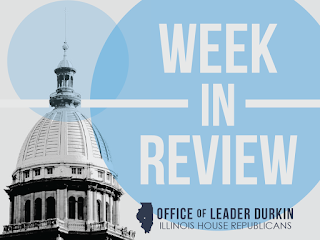 "SB 867 helps alleviate unnecessary burdens to allow Illinois businesses to thrive." State legislators also hailed the action. "It's about time," cheered Rep. Mark Batinick, R-Plainfield, a chief co-sponsor in the House. "This should be just the first step of many to make Illinois a more business-friendly place." "This legislation provides some relief for the small business owners, who drive the Illinois economy," added state Rep. David S. Olsen, R-Downers Grove. "It sends a clear message to those who provide jobs in our state that we want to ease their burden so they will remain and expand their businesses here. I look forward to continuing to work with my colleagues to find more comprehensive measures that will provide tangible relief for business owners across our state." 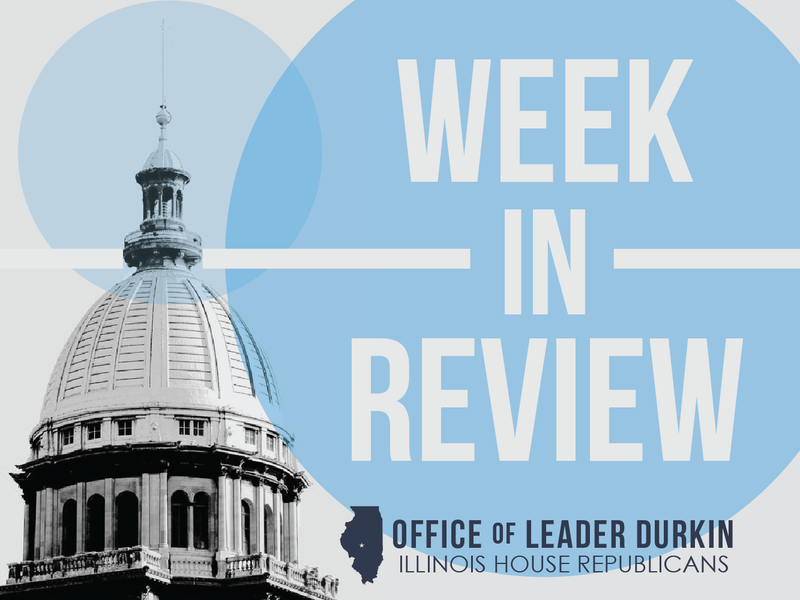 State Rep. Peter Breen, R-Lombard, said landing a more competitive stance with neighboring states on the LLC fee front is a key step for Illinois. "We need further significant reform to our state's business laws and regulations to help small businesses create more good-paying jobs in our state," he added. IDES reports major unemployment insurance rate cut. The rate cut comes in the form of lower taxes imposed on Illinois wages through mandatory contributions to the state Unemployment Insurance (UI) trust fund. In prosperous times, the State is required by law to reduce the rate of contributions that it imposes on employers as a tax. With the State’s economy relatively prosperous, the Illinois Department of Employment Security (IDES) at year-end 2017 is asking for $1.8 billion/year in mandatory (i.e. tax) contributions, a decline of $800 million/year from the $2.6 billion/year demanded by IDES four years ago at year-end 2013. UI contributions are not officially counted as “taxes,” but employers have to pay them; they are a supplemental cost to the Illinois economy and are imposed on the employer/employee relationship. Furthermore, to the extent that employees are paid market rates for their labor, UI taxes are a hidden tax upon labor. Instead of paying money to an employee as wages or benefits, the employer is required to pay part of the money to the State to create the fund that pays unemployment benefits. The drop in Illinois UI contributions/taxes reduces this burden throughout the state. This trend could, however, be reversed upon the next economic downturn that requires substantial UI payments to be made to unemployed workers. News of the UI contributions cut was shared with the business/labor community at the fourth-quarter 2017 meeting of IDES’ Employment Security Advisory Board. Illinois drops to the sixth largest state. As 2017 came to an end, the U.S. Census announced its end-of-year U.S. state population estimates. These numbers indicate that Pennsylvania has once again passed Illinois to regain its position as the U.S. state with the fifth largest population. Both states have more than 12.8 million residents. Census end-of-year estimates are based upon statistical analyses of population trends and are not based on actual physical counting. The U.S. Constitution requires the Census to physically count all Americans once every ten years, with the next true census set to be taken in 2020. Households will receive paper forms in the mail to fill out and send in, with census takers physically fanning out to visit households that do not return the forms. The end-of-2017 Census announcement marked a reversal from the late 1990s, when Illinois (the 6th largest state in 1990) passed Pennsylvania (the 5th largest state in 1990, as it is again in 2018). Illinois was #5 in the 2000 and 2010 censuses. Both states have had almost stable populations for the past thirty years. Invest in Kids program attracts $36 million on first day. Illinois’ new Invest in Kids scholarship program — which gives low- to middle-income students opportunities to attend non-public schools that best meet their educational goals — attracted more than $36 million in pledged contributions on Tuesday, Jan. 2, the first day the state began accepting applications, Gov. Bruce Rauner announced this week. Taxpayers wishing to contribute to Invest in Kids may apply online through MyTax Illinois, the Illinois Department of Revenue’s free online account management program. For more information on the Invest in Kids income tax credits, including bulletins, FAQs and a list of approved scholarship granting organizations, visit Investinkids.illinois.gov. A YouTube video is available on the website to assist taxpayers with MyTax Illinois registration. Questions may be emailed to: REV.PRD@illinois.gov. Governor appoints members to Mahomet Aquifer task force. The Mahomet Aquifer, a thick band of permeable underground sand and gravel that carries water, is used as the primary water source in much of east-central Illinois. The aquifer follows the pathway of a long-vanished river that carried water down toward the Gulf of Mexico. It still flows underground; before the recent ice ages, it was a surface river like the Mississippi. At least 750,000 Illinoisans drink Mahomet water and work in jobs that depend on this water source. With increasing concerns about possible toxic chemical threats to underground water, many local governments and their citizens have asked the State to coordinate efforts to protect this key aquifer for safe future use. The Task Force will hold hearings, gather data, and report recommendations to the General Assembly by July 1. Unemployment rate steady at 4.9% in November 2017. The November 2017 unemployment report by the Illinois Department of Employment Security showed continued relatively low unemployment rates in Illinois. The 4.9% unemployment number, which covers nonfarm payroll job positions, signals conditions of relatively close to full employment in Illinois. During November, there were approximately 6,045,000 persons working in nonfarm payroll jobs in Illinois. This accounted for almost one-half of the state’s population. The Department tracks Illinois jobs by broad categories to uncover areas of strength and weakness. As in previous months, strong job creation was seen in areas of specialized services. During the 12-month period ending in November 2017, Illinois enjoyed major job creation in financial activities, professional and business services, and education and health services. Each of these three categories generated more than 7,000 net new statewide Illinois jobs during the twelve months ending in November 2017. Many of these jobs were filled by persons with specialized postsecondary job licenses and credentials. Other positions saw net job losses in Illinois during the same period. Particularly hard-hit were the federal, state, and local governments, which lost 8,000 jobs during the same period. In addition, Illinois did not create as many net new jobs as many neighboring and comparable U.S. states. Illinois kicks off Bicentennial Year. Illinois will celebrate its 200th birthday in 2018. It was two centuries ago that a small frontier territory, with a bit more than 30,000 people living in it, asked Congress to admit it to the American Union of States. Based on reports that the new land was highly fertile and would be home to many farms and farm families, Congress and President James Monroe granted statehood to the Illinois Territory in the year 1818. The Abraham Lincoln Presidential Library and Museum, in cooperation with Mid-West Family Broadcasting and the Illinois State Museum, will be rolling out “Bicentennial Minutes” for radio listeners throughout the year. The Illinois Broadcasters Association will make the audio spots available to radio stations throughout the state. The short spots will highlight triumphs, tragedies, and little-known side stories of Illinois’ first 200 years. In addition, a wide variety of local celebrations will be held throughout Illinois throughout the Bicentennial Year. Illinois public and private sectors are coming together in the “Born, Built and Grown” campaign, a statewide initiative to create opportunities for Illinoisans to celebrate their heritage by appreciating things made, grown, and experienced in Illinois.